Kodaly Strings | The best place for parents and teachers to learn about world class music education for string instruments! Based on European conservatory approaches and the work of Zoltán Kodály. Follow us and enrich your life and the lives of your students and children! Wondering what I might add to the fixed-do versus moveable-do debate, probably the best thing would be to relate my own experience in becoming a musician. Growing up as a violinist in America, the only system I was given for referring to notes was an absolute one: letter note names that could be fingered on the instrument. Early on, I had to find a note on my violin by its note name in order to know what it sounded like. I had not been taught how the tones related to each other to make music. Later, I surprised myself when, as a high school student, I found I could pick out tunes by making lucky guesses for fingerings. As a music major in college, I attended all my theory and aural skills classes, learning intervals by their numbers, sometimes being helped by attaching the sound of a well-known tune to that interval. For me, this system was not adequate in helping me to hear in my head what I was reading on the page. Using my ears to form pure intonation with other instrumentalists or with myself was not a problem, since matching tones is a different skill from being able to perceive musical structure and tonal relationships. It wasn’t until I was taught, much later, the use of moveable-do sol-fa that my ears awakened to tonal structure. I rejoice that now I can hear a note as a sol, or a fa, or a ti, in any key. The system is such a simple, marvelous template that can be moved anywhere around the tonal universe! It was a huge light bulb! I found this to be such an important piece of the musicianship puzzle that was previously missing in my own education, that I created a curriculum of my own for teaching my students from the beginning to have well-trained ears. As I became aware that a fixed-do system existed as another way of learning the absolutes, I wondered why use it? We already have a set of note names that functions very well. Not until I learned that not all countries use these letter note names, but use sol-fa names for their notes did I begin to understand the problem. And so, what it boils down to is what you were brought up with and your willingness to master both an absolute and a relative system for referring to pitches. I went for a long time with ears which were asleep, because I was never taught any kind of relative system. Now, I can hear in my head what I am going to play, instead of what I just played. It is true that as music becomes more complex and/or atonal, the relative system becomes less useful and the absolutes more useful. That is one reason why both are necessary. As an educator, it seems to me the logical learning sequence is to teach the basic rules of tonality first as the foundation for understanding more complex forms. When it comes right down to it, most of the music we enjoy today is tonal anyway. String teachers! Are you discouraged by a lockstep approach using the same songs over and over without a way to adapt the method to the needs of your students? Do you lack a system for teaching your students how to hear in their head what they see on the page, as a guide for their fingers? Early in my teaching career I felt a desire to solve these problems, knowing that the ability to hear in my head was something I didn’t learn until my college years. When I found the system for teaching music developed by Zoltan Kodaly, I knew I had found a way to help my students become better musicians, not just instrument-playing machines. Intermuse Academy gave me the tools to teach these skills to my students. No longer were they dependent on hearing a passage before they could play it. Helping them develop music literacy based on their ability to hear with an educated ear has been a joyful experience. I’m teaching them music, not just the violin! Join us this summer, June 6 – 17 at Brigham Young University, Intermuse Academy to participate in the Kodaly vision. Come for a fun and intense experience! You will receive an effective string curriculum and expand your own skills in musicianship, pedagogy and conducting. Click this link NOW for more information! It’s been a long time since I posted on my blog, so here’s what’s new. Last year, after the school district decided to charge me a lot of rent for the after-school use of the building, I decided to go out on my own to create my own school for strings. With some advertising I was able to put together a class of six 4 and 5-year-olds which met twice a week for singing-musicianship. That was a lot of fun! Children that age are so unpredictable! And they love the games and songs! With a small class, everyone gets a turn every time. Taking and giving turns is an important life skill for these children. By the time we ended in April, the list of songs they knew was gigantic! Beat and rhythm were well-known elements of music, and they became familiar with quite a few composers. Expressing the music in their dance movements was also very important. 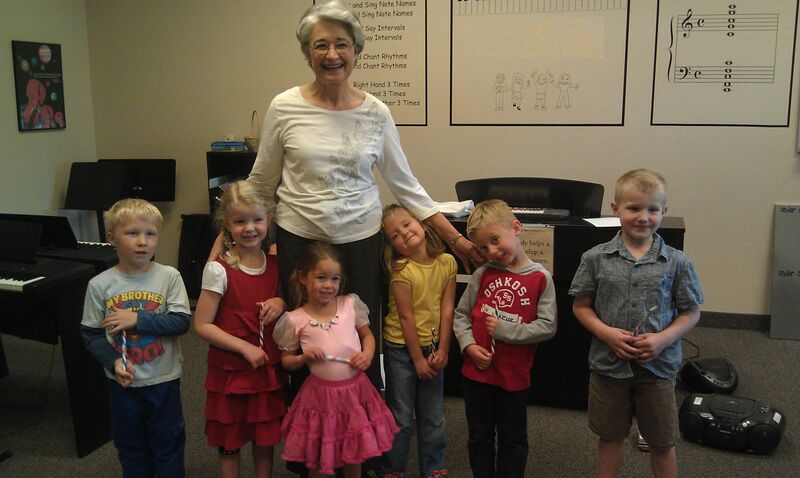 In addition to the kindergartners, my first-year violin class consisted of five children ages 6-9. In 12 weeks, from September to December, we covered basic 1st grade Kodaly singing curriculum and part way through 2nd grade. (It’s not hard to have an accelerated course when the class is small. For one thing, you get through the games a lot quicker and can cover a lot of material in a short time.) In January, the children began their study of the violin. The course changed from a twice-a-week 45-minute singing class, to a weekly 30-minute private violin lesson and one-hour group class. We spent half the class time playing the instrument, and the other half continuing on with learning the elements of music through singing-musicianship. I teach the students to sing and hear a new element before they play it. Then they learn to read and write the element, composing and improvising music of their own. The plan worked beautifully. It was a great year! By the end of May, it was amazing how well the children could play, and more important, how much they knew in their heads and ears given the few short months they had been studying. The goal this summer has been to have the students finish Book 1 of the Complete Musician in private lessons, so we’re ready to move on to Book 2 at the beginning of the school year. I sold my previous home and moved into another with an unfinished basement, which I am making into a classroom, ready for another first-year class and continuing on with other classes. I want to post the progress of our facilities and the program on a consistent basis. Questions and positive comments are welcome.